Quartet at Ritz Plaza Recap!!! I’ve just caught my breath after a week in Barcelona and returned home to pictures from the Quartet‘s performance at Ritz plaza. Did you make it out to hear the music? If you didn’t you can check out the Gallery instead. It was a whirlwind 3 hrs…the weather graced us with no rain, and the sun even peaked through on a tune or two. 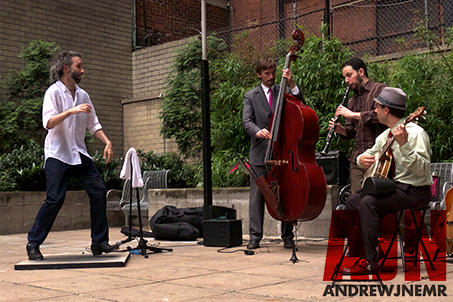 The quartet played an amazing three sets and we even had a couple dancers swing out with us. AND the amazing Tamar Korn made a surprise guest appearance. Friends and passers by joined in the listening pleasure as the music filled the air. A special thank you to real estate company Stonehenge for hosting us in their Ritz Plaza Park! You can thank them by becoming their fan on facebook and following their blog. They are always hosting excellent, free events for the NYC community as part of their dedication to the lifestyle of New York.